To get rid of the issues that occur from manual dialing, VoIP specialists introduced predictive dialer. A perfect pitch dialer which automatically dials the numbers by screening out the unanswered calls, busy signals and drop calls. It uses algorithms to define the time intervals to call and to estimate the time when the agent would be available for the next connected call. Predictive dialers have been around for about 30 years, changing their form from hardware solution to software and then from software to cloud-based solution and setting triumphs in every field. There are many solution providers who are offering such predictive dialers. The one leading solution among them is Avatar Dialler which offers you a perfect pitch predictive dialler with its product as a built-in feature of Avatar Dialler. How does Avatar Predictive Dialler work? 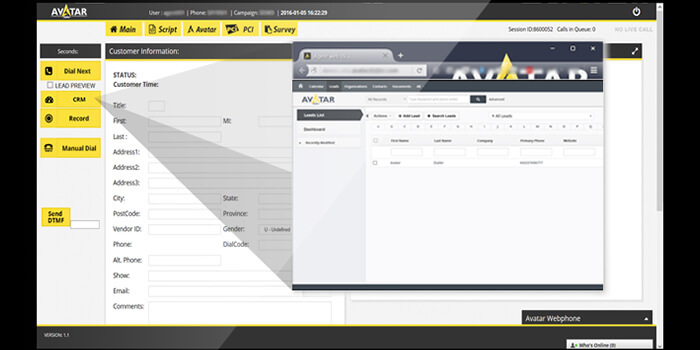 Avatar Dialler provides the sophisticated perfect pitch dialler for your marketing calls. It dials the list of phone numbers automatically and connects the call to an agent only when connected by saving time and all the hassle that the agent went through for getting a connected call. Agent gets connected to the next call as soon as he finishes the previous one without ever facing busy signals or unanswered calls. Predictive dialer uses statistical algorithm in order to minimize the occurrence of call being connected when no agent is available. This Perfect pitch predictive dialler also works with the set quota of call. The user sets the dialing ratio and dials call according to the assigned ratio. Predictive dialler is built in feature of Avatar Dailler. Avatar Dialler provides you the best feasibility by enabling its perfect pitch dialler to integrate with any CRM. Avatar Dialler offers their own CRM as well but if you have already one then predictive dialer can be integrated with your existing CRM. This predictive dialler also increases workforce productivity and utilization when contacting large lists of leads. What you get from Perfect Pitch Predictive Dialler? “Predictive dialers can improve agent productivity by 400%”. “ Increased agent utilization from 40 minutes/hour to 57 minutes/hour”. So why don’t you grab the opportunity to boost your sales and corner tele market with Avatar Dialler Perfect Pitch Dialler?